The fifth Running of the Bulls of this year’s Sanfermines featured bulls from the Jandilla bull-ranch. It was a fast clean event with the bulls racing along at a very fast pace over the whole course. Several runners suffered bruising and contusion from knock-downs and trip-ups. The bulls stayed close together in a pack until the final stretch, where two bulls slipped up and fell as they headed down to the bull ring entrance. One of them got up quickly only to fall again inside the passageway leading to the arena where it fell on top of some prostrate runners. The same black bull was on the point of goring one of the fallen runners when its large horn grazed the runner but it seems did not penetrate his skin as the first medical report does not contain any injuries from gorings. Finally, these last two bulls managed to get to their feet again and headed off to the pens thus ensuring that the whole Running of the Bulls was completed today in 3 min. and 4 secs. In fact the first four bulls had earlier entered the pens at a very fast pace of just a little over 2 minutes. The bulls had come out of the pens in Santo Domingo in a tight pace and they raced up the slope at a very rapid speed. It was difficult for the runners to get close to the horns as the bulls were going so fast. Many runners were knocked down as the bulls raced along. The bulls remained in a tight pack almost till the final stretch leading down into the bull ring entrance. Here two bulls slipped up and struggled to get back on their feet. One of the bulls got up and raced into the passageway only to fall again on top of some fallen runners. Here some runners helped the bull get back on its feet just as some other runners had earlier done with the bull which had fallen on the slope leading to the entrance of the bull ring. Both bulls finally found the pens without more ado. In 17 this was the 8th time that the Jandilla did not cause any gorings. Jandilla is the 4th bull-ranch with the highest average number of injuries (7,59 per running of the bulls). 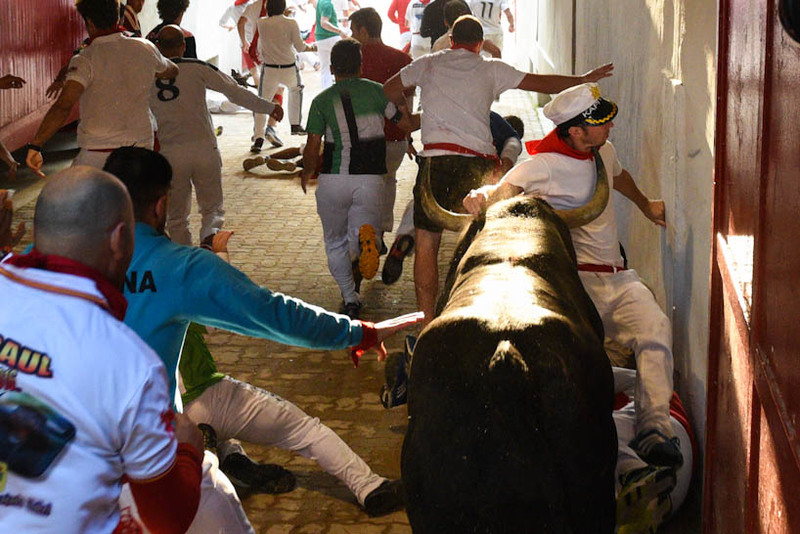 Among the 17 running of the bulls of Jandilla in Sanfermin this has been the 8th longest (3'04''). The slowest was on 07/11/2005 (5'33'').